Giving vent to discontentment after being denied ticket from Rajpur, Sports Minister Khazan Das today declared that he would fight the elections as an independent. Khazan Das said he had made his intention known to the party that he would be fighting from the Rajpur seat after the Dhanolti seat, from where he is a sitting MLA, was de- reserved. “I have been a disciplined soldier of the party but there is pressure from my supporters to contest from the Rajpur seat that I had begun to nurture,” he said. Narayan Singh Rana, senior BJP leader and a close relative of former national president Rajnath Singh, is livid at the party for naming Mahavir Singh Rangad as the candidate from the Dhanolti Assembly seat. Rana, who is also the father of ace shooter Jaspal Rana, speaking to the Tribune said the party had erred while giving the ticket to undeserving candidate Mahavir Singh Rangad from Dhanolti. 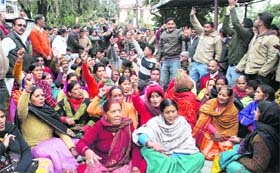 In a major embarrassment to Chief Minister B.C Khanduri, who is said to have played a major role in the distribution of the tickets and on whom the central leadership is banking heavily to steer the BJP’s ship in the forthcoming elections, was today given a taste of his own medicine by defiant party workers of Kotdwar, who laid siege of the party headquarters, questioning the logic behind fielding Khanduri from the Kotdwar Assembly seat. A meeting of the working committee of the Uttarakhand Kranti Dal (D) headed by Luxman Singh Chufal held a marathon meeting in the evening to discuss the discontent in the aftermath of party president Diwakar Bhatt’s decision to fight the Assembly elections on the BJP’s symbol. The newly formed local political outfit, Manav Adhikar Janshakti Party, today announced that it would contest 15 seats in the Assembly poll slated for January 30. It also announced that it could contest more seats if the desired candidates were found. In a tragic incident, two workers got electrocuted while coming in touch with a high- tension wire in the industrial region of Roshanabad here today. As per information from the SIDCUL police check post, the installation of electric poles was being done by contractual workers of Jagdamba Traders for the SIDCUL electric subdivision. A brilliant hat-trick by Varun led the Doon Star Football Club to register an impressive 5-2 victory over the Shivalik Club in a match in the Ram Bahadur Chhetri Memorial Football Tournament being played on the Forest Research Institute (FRI) ground here today. 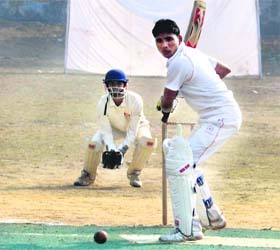 Uttar Pradesh Blue Cricket team defeated Venus Club, Ghaziabad, by six wickets in the 26th Banke Lal Shah Memorial Under-15 Cricket Tournament played at Rangers’ college ground here today. Venus Club won the toss and elected to bat first. The team scored 106 runs for six wickets. Sumit was the top scorer with 42 unbeaten runs. Nihal took two wickets for 18 runs. Giving vent to discontentment after being denied ticket from Rajpur, Sports Minister Khazan Das today declared that he would fight the elections as an independent. Khazan Das said he had made his intention known to the party that he would be fighting from the Rajpur seat after the Dhanolti seat, from where he is a sitting MLA, was de- reserved. “I have been a disciplined soldier of the party but there is pressure from my supporters to contest from the Rajpur seat that I had begun to nurture,” he said. However, he refused to divulge whether he would quit the BJP. Meanwhile, the sitting MLA from Sahaspur, who was hoping to get the Assembly ticket from Purola, held a sit-in at Gandhi Park. After remaining incognito yesterday, Rajkumar emerged today only to stage a dharna at Gandhi Park along with his supporters. “After fighting the election from the plain, Sahaspur, I was keen to go back to the hills to serve my people but I have been denied ticket from Purola,” said Rajkumar. His supporters added that most of the leaders in the state were migrating to the plains. His was the only case of reverse migration. While his supporters continued to voice their protest at the BJP party headquarters, he kept himself away from the party headquarters. Meanwhile, with most of the supporters of former Chief Minister Dr Ramesh Pokhriyal Nishank bearing the brunt of the high command’s selection procedure for the Assembly seats, the party office was agog with rumours how the protests have been orchestrated by Nishank himself. Narayan Singh Rana, senior BJP leader and a close relative of former national president Rajnath Singh, is livid at the party for naming Mahavir Singh Rangad as the candidate from the Dhanolti Assembly seat. Rana, who is also the father of ace shooter Jaspal Rana, speaking to the Tribune said the party had erred while giving the ticket to undeserving candidate Mahavir Singh Rangad from Dhanolti. Rana elaborating further said party workers were let down with the party decision to give ticket to Rangad from Dhanolti as he was the same person who had been venting his ire against the party for the past five years. Rana further said Rangad did not have any mass base appeal and the BJP would lose the seat if the party did not change the candidate from Dhanolti. Rana also informed The Tribune that all other probable candidates were also of the same view, including the state Cabinet Minister Khajan Das, who has also been refused the ticket from the Rajpur Assembly segment. Rana affirmed that all senior party leaders from the region were in discussion with the high command and had aired their views about wrongful ticket distribution and were demanding to change the candidature without further delay. Rana also refuted the claims of Jaspal Rana joining the Congress. Rana asserted that he was a dedicated soldier of the BJP for the past 25 years and would never betray the party and all the stories appearing in the media in this regard were fabricated and with malefic intention. The Dhanolti seat has been de-reserved after 43 years and considering that the list of probable candidates this time was longest in both parties. Therefore, the distribution of ticket for the BJP in these elections was a real headache for the party bigwigs. Meanwhile, senior party leaders have begun a damage-control exercise as several long-drawn meetings with all sections were on till the filing of this report. Incensed party workers comprising zila panchayat president and office-bearers of Kotdwar district unit of the BJP said the leadership did not take the sitting MLA (Shailender Singh) Rawat into confidence. “If he was to be made the sacrificial goat, the Chief Minister should have taken him into confidence. But neither Khanduri nor the party leadership took sitting MLA Rawat into confidence,” said Harshvardhan Binjola, vice president of the BJP (Kotdwar Mandal). Facing the wrath of the party workers since yesterday, the party leaders, who were witness to the protests at the BJP office today, never imagined in their wildest dreams that there would be a revolt against their Chief Minister, who was especially brought back to shore up the party’s dwindling fortunes, ahead of the elections. In fact the party workers today flayed the central leadership’s reliance on help-book style of electioneering. “There are no manuals available on winning elections. The central leadership has denied the ticket to several sitting MLAs to ward off anti-incumbency. The same rule should apply equally to all the MLAs. But several of them have been given the ticket again,” said Anil Nautiyal, sitting MLA from Karanprayag, who was denied the ticket. His supporters charged that Harish Pujari, too, managed to get the ticket for Karnprayag Assembly seat because as he was associated with the Bahuguna Vichar Manch, an association that is linked with B.C Khanduri’s family. Even the senior party watchers say the central leadership’s strategy can come unstuck, if there is no wave in favour of the BJP. “The BJP has tried to project Khanduri as a strong leader but in the absence of a wave, the BJP’s strategy can come unstuck,” said a senior BJP leader. The members were exasperated about Bhatt’s decision. 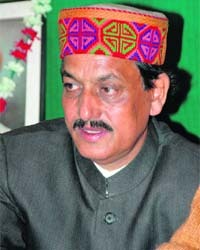 Since the meeting was going on when this report was filed, an opinion was building up to expel Bhatt and MLA Om Gopal Rawat along with other senior leaders who were party to this decision and appoint Bishan Singh Chufal as the new president of the party or else give mass resignation if party leaders desisted on their former decision. It was in the evening that around 40 members of the working committee, which comprises 60 members and completes the quorum to make any decision, got together to denounce Bhat’s decision and to strategies about their next move. Party spokesperson Sunil Dhyani said Diwakar Bhatt destroyed their long political career by taking sides with BJP and had reiterated his history of breaking the party time and again. “We can never imagine campaigning for BJP. If we had to join national parties, then there was no need to float a regional party which fought for the formation of this state. The party leaders like BD Raturi, Diwakar Bhatt, Om Gopal Rawat had sold the party for their own interests,” he said. It was in the day, many members and leaders like Jagdish Chauhan of UKD (D) were seen holding talks with leaders of UKD (P) to join their side. UKD (P) seems to be taking only the activists but not the leaders who were expelled from the party. 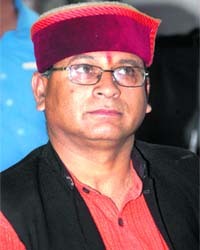 Prakash Joshi of UKD (D) has shifted to Uttarakhand Raksha Morcha and will now fight from Sahaspur and Basant Joshi left for UKD (P) and will contest from Lal Kuon. About the party’s agenda, state vice-chief of the party Yashpal Singh Rawat said the purpose of floating the party was to bring in honest and dedicated people in the mainstream of politics. Yashpal, who will be contesting from the Haridwar (city) segment, said the party had decided to field more than 15 candidates, but it was only possible if they found candidates with a clean image and who were ready to work for the welfare of the people. State chief of the party Naveen Kumar said an equal representation of people belonging to the hilly and plain areas had been made in the party executive working body. Around 2:20pm near the Navodaya school intersection, while installing an electric pole, the pole fell on a nearby high-tension electric line. As the high voltage current was passing through it, two workers who were holding the installing pole came in direct contact with it. Both of them died on the spot whose names are Vipin, 21, and Braham Singh, 20, both residents of Gajraula, Hastinapur, Meerut. One of the workers, who got injured, was immediately taken to Jolly Grant hospital where he was reported to be out of danger. Till the filing of the report, the relatives of the deceased and injured were on their way to Haridwar. The SIDCUL Industrial Association has expressed shock over the incident and has demanded adequate compensation from the state government to the families of the deceased. A brilliant hat-trick by Varun led the Doon Star Football Club to register an impressive 5-2 victory over the Shivalik Club in a match in the Ram Bahadur Chhetri Memorial Football Tournament being played on the Forest Research Institute (FRI) ground here today. 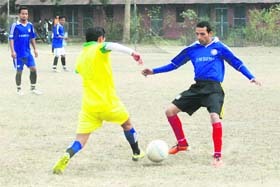 Doon players scored the first goal through Manish Kahtri in the 17th minute. Vikas scored the second goal in the 23rd minute. Later, Varun scored three goals in the 28th, 40th and 58th minutes to give a formidable lead to his team. The Shivalik Club team tried hard and scored two goals in the 45th and 52nd minutes through Lokesh and Surender, respectively. In the second match, the Wills Youth Club beat the Gypsy Club 2-1 in a close encounter. The Gypsy Club team took lead in the 35th minute when Surender Subba executed an excellent goal. However, this prompted the Wills Youth players to come up with their best. Uttar Pradesh Blue Cricket team defeated Venus Club, Ghaziabad, by six wickets in the 26th Banke Lal Shah Memorial Under-15 Cricket Tournament played at Rangers’ college ground here today. Venus Club won the toss and elected to bat first. The team scored 106 runs for six wickets. Sumit was the top scorer with 42 unbeaten runs. Nihal took two wickets for 18 runs. In reply, Uttar Pradesh blue team scored 107 runs for the loss of four wickets to win the match by six wickets. Nihal scored 29 runs, while Rakesh also scored 29 runs for their team. Vibhu, Vikas, Sumit and Tarang took one wicket each.